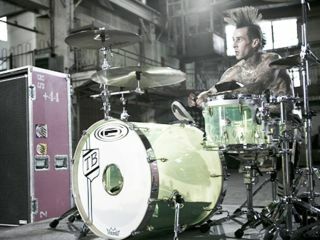 Blink-182 drummer in "good condition"
Former Blink-182 drummer Travis Barker has been released from hospital after surviving a jet plane crash that killed four people. Barker and Adam Goldstein - aka DJ AM - were the only survivors of the take-off crash of a Learjet 60 at a South Carolina airport. The pair jumped from the burning plane, suffering burns and other injuries. Goldstein was released on 26 September, and Barker has now left hospital "in good condition" after receiving treatment for burns to his back and lower torso. It was originally suggested Barker would spend a further two weeks in hospital. Good news.